Severe peripheral vascular disease (PVD) is caused by the formation of blockages in arteries, which reduces blood supply to the brain, heart, kidneys and limbs causing strokes, heart attacks, kidney failure and limb amputations. The disease is a growing international healthcare problem affecting about 20 per cent of the UK population aged 55–80 years and 200 million people worldwide. 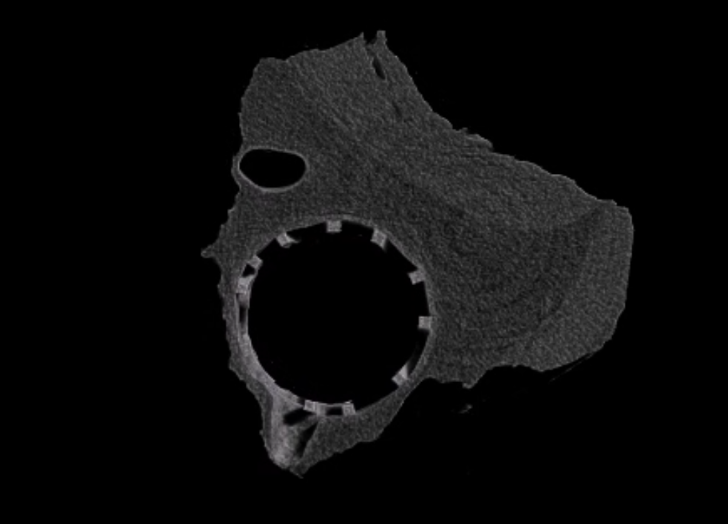 The two-year project is the culmination of a research-industry consortium comprising Leeds-based medical device company Arterius and University of Bristol researchers led by Professor Raimondo Ascione at the Bristol Medical School. The Biomedical Catalyst is a unique partnership between the Medical Research Council and Innovate UK, providing responsive and effective support to the most innovative life sciences opportunities to accelerate the progress of novel products toward patient benefit. SMEs can apply for a share of up to £8 million to continue a project’s early stage development and technical evaluation, up to readiness for clinical testing. provide support to academically and commercially led research and development. The programme is run by Innovate UK and the Medical Research Council, both part of UK Research and Innovation. Arterius are pleased to welcome Prof. Patrick Serruys and Dr. Yoshi Onuma to our clinical advisory board. Prof. Serruys (Imperial College, London) will become chair of the clinical advisory board, also now featuring Dr. Onuma (Cardialysis, Netherlands) and Dr. Rasha Al-Lamee (Imperial College, London). Prof. Patrick W. Serruys is is a professor of Interventional Cardiology at the Interuniversity Cardiological Institute of the Netherlands (1988-1998), and Erasmus MC. Since 1980 he was a Director of the Clinical Research Program of the Catheterization Laboratory, Thorax Center at Erasmus University, and till April 1st 2014 (retirement date) the Head of the Interventional Department, Thorax Center, Erasmus MC (University Medical Center Rotterdam), Rotterdam, The Netherlands. Since April 2013 he holds the position of Professor of Cardiology in the Cardiovascular Science Division of the National Heart and Lung Institute (NHLI) at the Faculty of Medicine, within the Imperial College of Science, Technology and Medicine, London. He is a Fellow of the American College of Cardiology and a Fellow of the European Society of Cardiology and scientific council of the International College of Angiology. Dr. Yoshinobu Onuma, MD, PhD is a leading expert in the field of bioresorbable scaffolds. He also has extensive expertise in quantative coronary angiography (2-dimensional, 3-dimensional and bifurcation-dedicated), intravascular imaging, Syntax Score and metallic stents. Dr. Onuma received his medical degree from Tohoku University School of Medicine in Sendai, Japan. He completed his internship and residency in internal medicine at Mitsui Memorial Hospital. He fulfilled his cardiology and interventional cardiology fellowship at the same hospital. He joined the Erasmus University of Rotterdam in 2007 and was granted his doctorate in interventional cardiology in 2014. Dr. Onuma has published more than 200 manuscripts in peer-reviewed journals. Prof Serruys and Dr Onuma will join Dr Rasha Al-Lamee and form the Clinical Advisory Board for Arterius Ltd.
ArterioSorb™ has been shown to show decreased acute thrombus formation compared to thicker strut bioresorbable scaffolds (BRS) in an in-vitro model. Shengjie Lu PhD, of the National Heart Research Institute and National Heart Centre Singapore, presented a moderated poster at TCT 2017 in Denver, showing the impact of BRS strut thickness on the formation of thrombus. 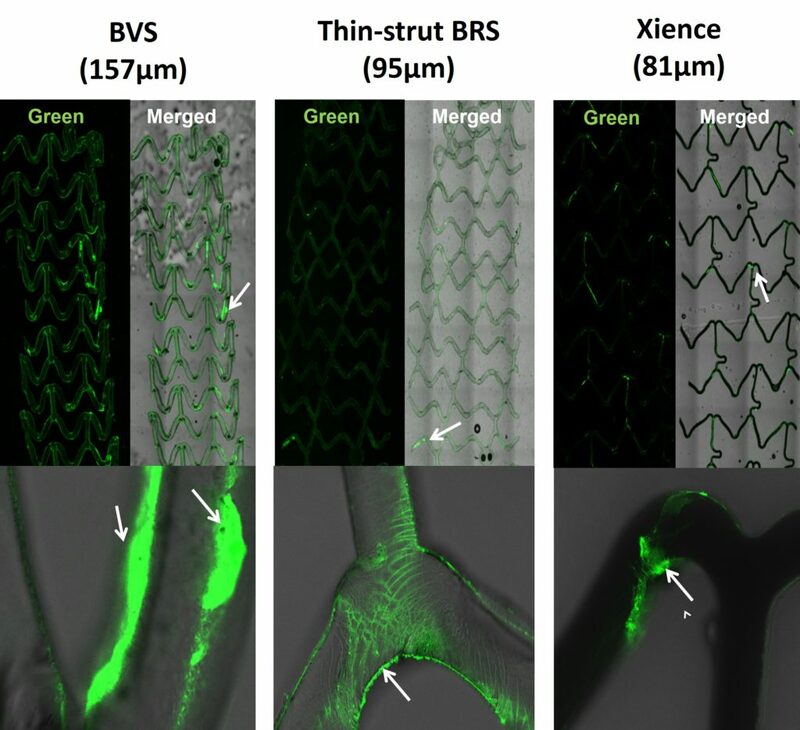 Shengjui, from Nicolas Foin’s group, compared thick strut BRS (157μm, Absorb BVS, Abbott Vascular) to thin strut BRS (95μm, ArterioSorb™, Arterius) and a thin strut DES (81μm, Xience, Abbott Vascular). Scaffolds were expanded in in-vitro coronary perfusion models which were perfused with porcine blood. Thrombus formation was then evaluated. 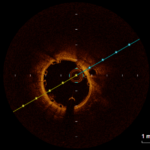 Thin strut ArterioSorb™ showed significantly smaller thrombus area compared to Absorb BVS (p<0.01). No difference was found between thin strut ArterioSorb™ and Xience (p=0.99). Summary: Compared to larger strut BRS, the thin strut ArterioSorb™ BRS and metallic DES show decreased acute platelet adherence and thrombus formation. The in-vitro model suggests that clot formation on scaffolds may be modulated by strut profile. This further corroborates the previously published endothelial shear stress data showing less disruption to the arterial blood flow for ArterioSorb™ compared to Absorb BVS. Regen Magazine 2017, published by the Medical Technologies IKC and Regener8, reports on activities and achievements of the regenerative devices community. In Issue 8 (2017) they featured an article on Arterius entitled “Taking on the Giants“. Following the successful completion of the R&D project in 30th September 2016 (supported by a Smart award from the Innovate UK (TSB), Arterius has recently been awarded further funding from the Biomedical Catalyst-Early Stage programme to conduct the In-vitro and In-vivo GLP Evaluation of the Novel Bioresorbable Coronary Scaffolds; ArterioSorb™. ArterioSorb™ is an innovative medical implant product currently being developed by Arterius, a UK medical device micro/SME, to treat coronary artery disease (CAD). CAD is the leading cause of death both in the UK and worldwide, responsible for more than 73,000 deaths in the UK each year. 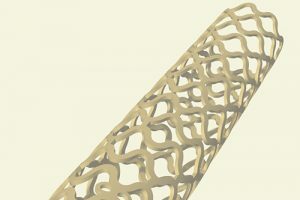 ArterioSorb™ is a next-generation bioresorbable cardiovascular scaffold (BRS, stent), to be implanted within the coronary arteries in order to open blocked vessels, and to biodegrade within two years when healing is complete and it is no longer needed. 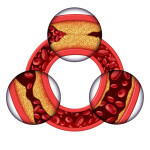 In this 24-month project, Arterius will perform the in-vitro and in-vivo studies necessary to demonstrate the safety and efficacy of ArterioSorb™. After completion of this study, the company will enter the First-in-Man trials and commercialisation, which will enhance the growth and global profile of the company, create new skilled jobs and enhance our global competitiveness in the field of stent technologies. 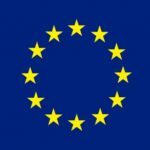 There is currently no UK company offering a BRS for the global market. Following this project, ArterioSorb™ will launch to compete with the global BRS products. 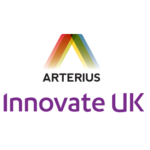 The goal of Arterius is to develop as a major UK SME with global competitiveness in the polymer based BRS market to treat cardiovascular disease. Dr Kadem Al-Lamee, CEO, said “Development funding supported by the Innovate UK (TSB) programme will significantly help the company to stay ahead of the competition and to continue their ongoing collaboration with the UK academics and clinicians, in order to continue this ground-breaking research and to commence clinical trials by 2019”. The Innovate UK (TSB) is the UK’s innovation agency. Its goal is to accelerate economic growth by stimulating and supporting business-led innovation. Sponsored by the Department for Business, Innovation and Skills (BIS), the Technology Strategy Board brings together business, research and the public sector, supporting and accelerating the development of innovative products and services to meet market needs, tackle major societal challenges and help build the future economy. For more information please visit www.innovateuk.org. The Biomedical Catalyst programme is managed by the Innovate UK (TSB), It offers funding to small and medium-sized enterprises (SMEs) with potential and ambition for growth, to engage in game changing, cutting edge innovation R&D projects in the strategically important areas of science, engineering and technology, from which successful new products, processes and services could emerge. Arterius are delighted to be working with Professor Patrick Serruys of Erasmus Medical Centre (Netherlands) and Cardialysis. 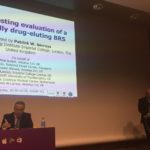 Professor Serruys presented a talk entitled “Bench testing evaluation of a novel fully drug-eluting BRS” at EuroPCR on 19th May 2016. The talk was part of the “BRS: Evolving Technologies and Applications” session, also featuring presentations about Elixir’s DESolve scaffold, Abbott’s ABSORB clinical data, Biotronik’s BIOSOLVE-II trial data, and REVA Medical’s Fantom scaffold. Prof Serruys presented the latest bench testing development results of the ArterioSorb™ bioresorbable vascular scaffold.